Professor Heikki Joensuu (born 1956), is a founder and board member of the Company. He received his M.D. degree in 1981 and Ph.D. degree in 1987 at the University of Turku, Finland. He is an oncologist recognized worldwide and has received many scientific awards for improving and developing cancer care. He is the Principal Investigator in several international multicenter trials, and has designed and conducted many clinical trials. He treated the first GIST patient with imatinib, was the senior investigator in the first randomized trial carried out with imatinib in advanced GIST, and led the research that resulted in adoption of the currently recommended adjuvant therapy with imatinib for patients with high-risk GIST. Prof. Joensuu and his collaborators developed two of the most frequently used risk estimation schemes in GIST, the modified NIH Classification and the Prognostic Heat maps. 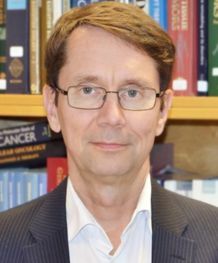 He has been the Professor of Oncology at the University of Helsinki since 1994, and was the Physician-in-Chief at the Department of Oncology, Helsinki University Hospital from 1995 to 2009. Prof. Joensuu acted as an Academy Professor of the Academy of Finland from 2010 to 2014 and as a Research Director at the Comprehensive Cancer Centre, Helsinki University Hospital from 2015 to 2017. At present, he is the Vice President of Therapy area Oncology, R&D in Orion Corporation.